The park, was declared as a national park in 2004, is located in Riau Province, Sumatra. It is a four-hour car journey from Pekanbaru. Not so long afterwards, around 8 pm, we arrived at the Flying Squad Camp of Tesso Nilo. Maybe I should back up here. At that moment, I was like “Flying Squad… Wait! Flying what?”. That was the very first time I had heard Flying Squad used in relation to forest and elephants. I thought the flying squad had something to do with flying, but according to Google, a flying squad is a division of a police force or other organization that is capable of reaching an incident quickly. OK! Then I got it. Elephant flying squad. After checking in to the homestay, we gathered at the hall, had dinner together and received a briefing about the next day activities. We would be joining the flying squad as it did its weekly patrol (they do elephants patrols twice a week). Early the next morning I found out that Ria and Tino, two elephants, were staying near our homestay. They seemed to be enjoying their breakfast and hanging out with the mahout. Elephants taking their first bath of the day! “I can handle this” Tino said. She can’t wait until the mahout feeds her. She likes to grab it directly from the plate! Food for the elephants at the flying squad included things like grass and reeds. For a treat, they are also given brownies (not the same brownies that we usually have though) twice a week. 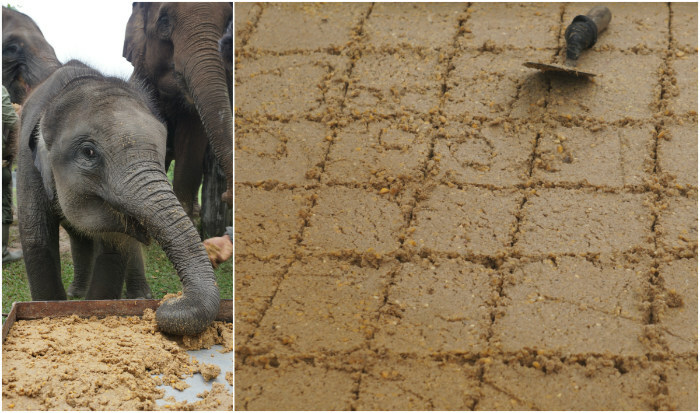 Just like most of us, elephants also love brownies. 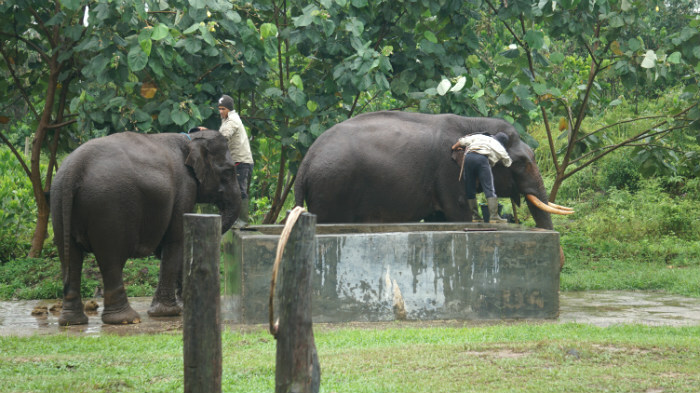 Caring for the elephants in Tesso Nilo involves bathing them twice a day and taking them to a place where they can eat and exercise. However, it was Tuesday and this is the day when the elephants of the Flying Squad Camp of Tesso Nilo go on patrol. A patrol will last for a maximum of 15 km though that day we only went 5 km. 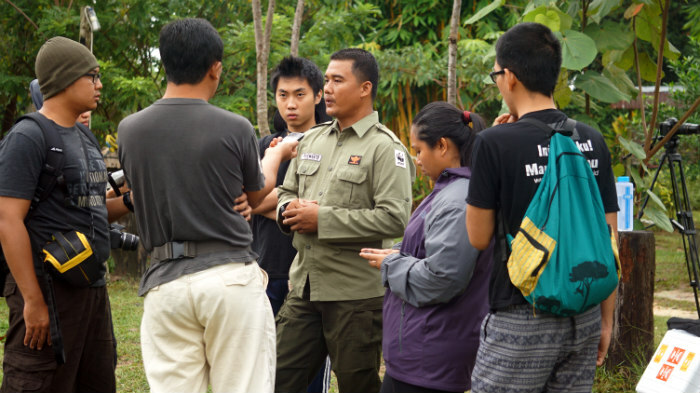 From the flying squad camp, we would head out to shelter III, then continue to the Nilo river. I was looking forwards to the journey. From the camp to shelter III, we passed thick forests. 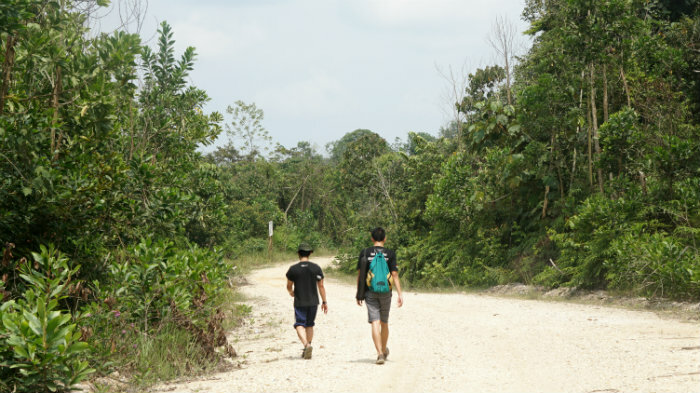 I rode Ria from the base camp until the Nilo river, but I decided to walk back from the Nilo river to the base camp together with Adit from WWF Indonesia and Jopang. You might be asking why the elephants need to do patrol in the National Park? Why is it so important? It’s an unfortunate reason. 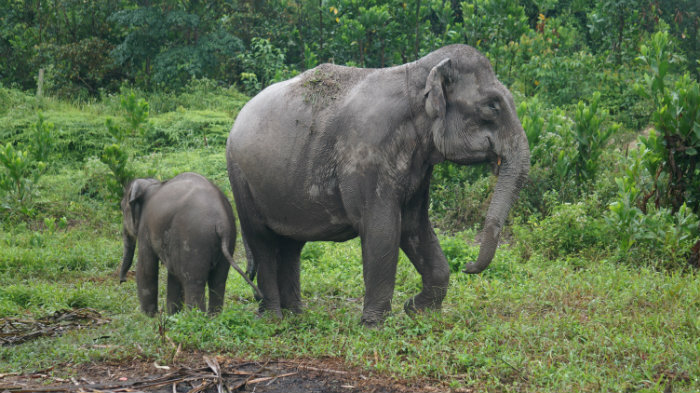 Sumatran Elephants are classified as critically endangered. According to WWF Indonesia, the elephant population in Riau is estimated, as of 2007, to be just 210 elephants. In 1985 there were 1,342 elephants. The elephants in Sumatra have lost around 70 % of their habitat and 50% the population in one generation (~25 years). Land abuse is the main cause of conflict and the primary threat in Sumatra. A lot of the elephants habitat is being lost to deforestation or has been converted to agricultural plantations. This pressure on land increases the level of conflict with the remaining elephant population. 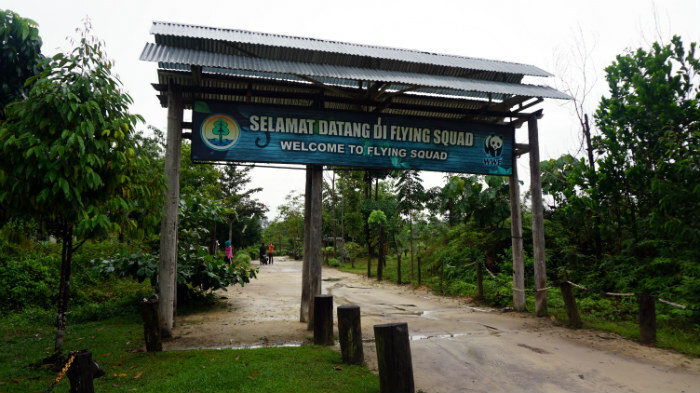 Tesso Nilo Flying Squad Camp is strategically located in the middle of permanent trek of wild elephants and tigers. Elephants flying squad helps solve human-elephants/wildlife conflict mitigation process. 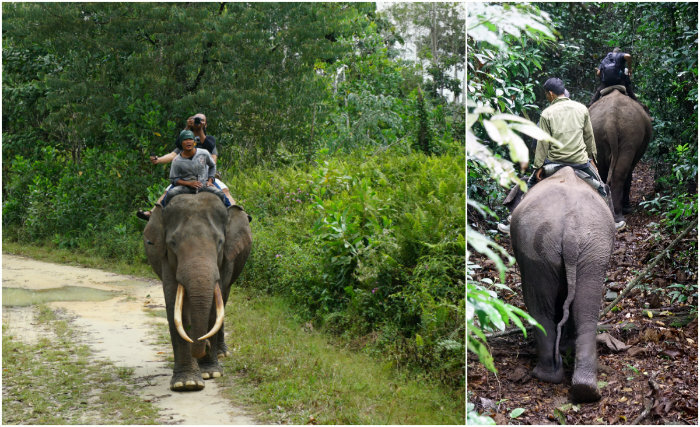 The trained elephants help to expel wild elephants near Air Hitam village and Lubuk Kembang Bungo village. In one month, they can deal with 3-4 cases. This means conflicts prevented and losses avoided. Besides the land abuse, poaching is also one of the biggest threats for Sumatran elephants. 1. Understand the important role of elephants in this world and the role they play in the environment. Btw, I think elephants are cool, and I hope you also think the same way too. 2. Do your best to spread the word. Let other people know that they should care too (plus why they should care). Let’s actively participate in conservation campaigns. You can start with following social media of WWF Indonesia, go check them out here: Twitter, Facebook and Instagram. 3. Make some action. You can definitely help with this! WWF Indonesia lately just launched the #BeliYangBaik campaign. They encourage you to find out and understand more about the product that you are going to buy. This helps you support companies that have environmentally friendly and sustainable policies. If your favourite product, sadly, isn’t environmentally friendly, then ask them to do so! Twitter is a great tool to make your thoughts heard. Great action always begins with small changes, so do whatever you can and don’t forget to ask your friends to live the green lifestyle too. 5 Reasons Why Elephants are so Cool! Agree with your last statement Mbak. We need to do things that we can do. Not just waiting for others to do it. Hope they succeed in getting their numbers back up … I mourn at the thought of a world without elephants! One elephant is pregnant when I was there so hopefully more elephants to come. 🙂 Slowly. I’m from Australia and i’m coming to Indonesia next week. I’m going to Sumatra to trek through gunung leuser national park. Im planning to go to Tangkahan or Besitang in North Sumatra. Where can i find details of the tour you did at TESSO NILO NATIONAL PARK with the Flying Squad? Thank you for stopping by here 🙂 I’ll send the contact through email. Have a great fun time in Sumatra!